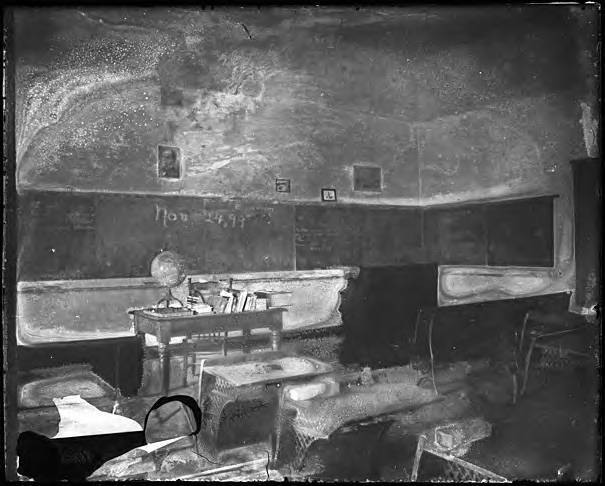 Black and white image of an empty schoolroom. The date 'Nov. 24, 99' is written on the blackboard. Note the books piled on the teacher's desk, the globe, and the piano. The desks appear to be wood with metal sides and legs, and the seats are attached to the desks. The man in the picture above the blackboard is very likely the just-reelected President of the United States, William McKinley.